This year, we started just like last year, at Zoe's request - breakfast consisted of pink pancakes (with an addition of mini chocolate chips this year) pink applesauce and pink milk. 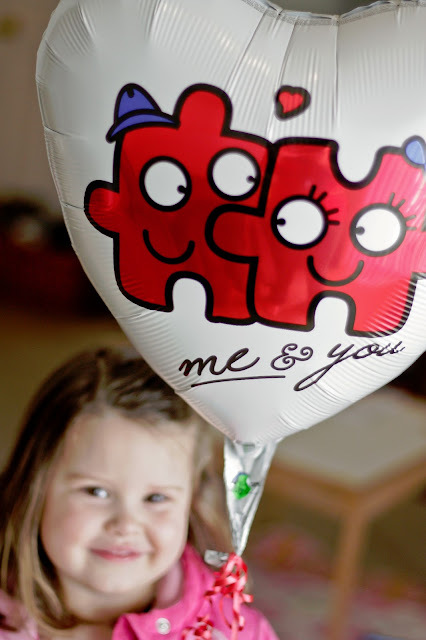 Zoe also got her choice of balloon - adorable right? We dressed up for Valentine's Day, I asked Zoe to take a picture of my scarf and this is what I got. Pretty good photography skills for a 4.5 year-old right? Tonight we're having take out and a bottle of Martinelli's. We'll exchange cards and probably watch some Netflix of some Justified. We're not that hard to please.